these are brilliant! you should go into business selling kits or ready finished buildings! "I always include some ‘foundations’, thus avoiding unsightly gaps under the walls"
what's the easiest way to do this for people (like me) who have just placed some buildings onto their layout and don't have any foundations? is it too late, or should i just use some model filler to fill any gaps at the bases? I saw those buildings and immediately thought North Essex. It's an area I know reasonably well. I initially guessed Thaxted so I wasn't too far out Really excellent modelling to capture the look of a very specific area like that. I look forward to seeing the layout develop. It's Finchingfield. A lovely 'round the pond' village. My version has to be a straight line (well, wavy line) version, but I hope I'm catching something of the original. I've got three or four buildings which sit directly onto the plywood baseboard and don't have foundations. They are the goods shed and other buildings in the goods yard so I've put some scatter around the bases to suggest weeds. I think this is the usual trick! My usual method is to add an extra 2 to 3 mm to the bottom of the walls when I cut them out. Most of my 'ground' is soft foam board so it's easy to cut a shallow pit into which the building is planted. I'll show this in a later post. After seeing such wonderful modelling, please do! Excellent! Stunning models. I've done some scratchbuilding with plasticard myself, even siting the buildings on a steep hill, but your work makes mine look like something out of amateur hour. A credit to you, Roger, and let me echo NewportNobby's suggestion that you submit your work to a major magazine. Definitely some of the best modelling I have seen in ages. Thanks for all the nice comments. Plenty more buildings to come in later posts. Hope it inspires some of you to reach for the plastikard! This was a pleasant outdoor job during June and July 2014. One thing hasn’t changed in the decades since I last built a layout – model railways need space. I decided that a rarely used spare bedroom was to be home for my layout, but it had to be possible to for a single bed to be used occasionally. The idea was to put the layout in the centre of the room and to store the bed underneath it, together with a couple of bedside cabinets. 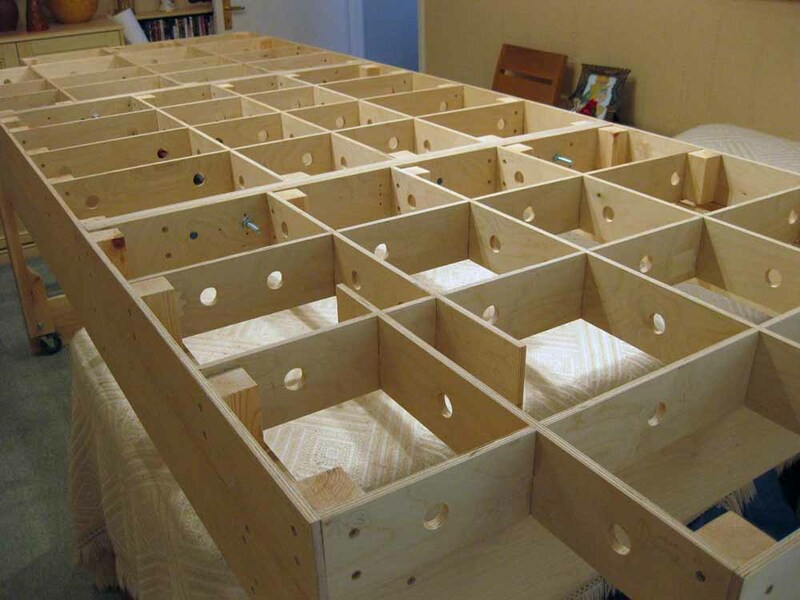 When necessary the baseboard should be capable of being moved to the side of the room leaving space for the bed. Although I don’t intend to exhibit the layout I did want it to be possible to move it out of the room without having to cut it into pieces so it would have to be capable of being dismantled fairly easily. After measuring the possible space I settled on 9’6” long and 3’6” wide. This would give me a width of 2’6” for the scenic area – plenty of room for the village – and 1’ width for the fiddle yard. 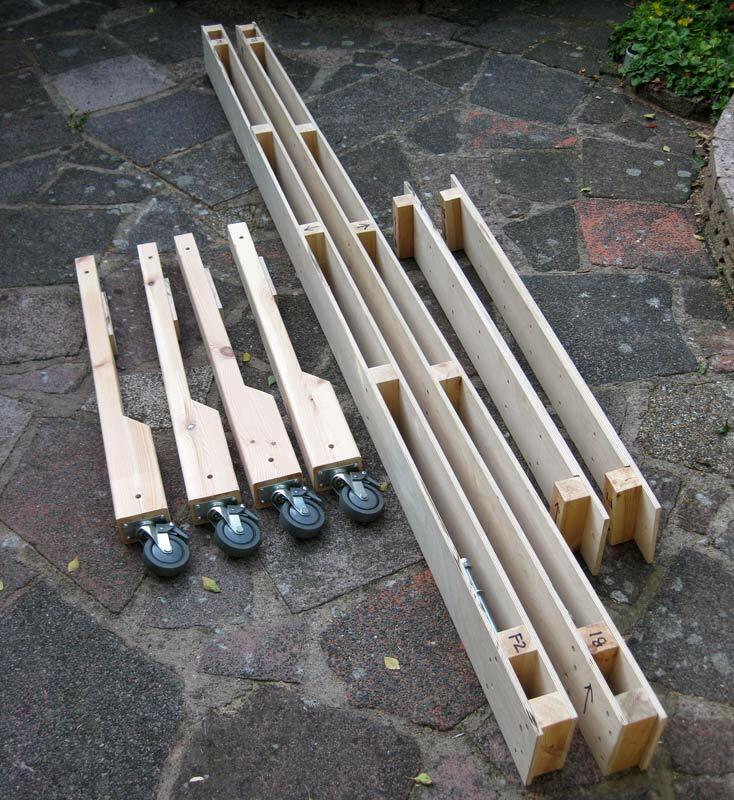 I decided to make three baseboards each 3’2” x 3’6” – a bit big to move often but just about manageable by two people. 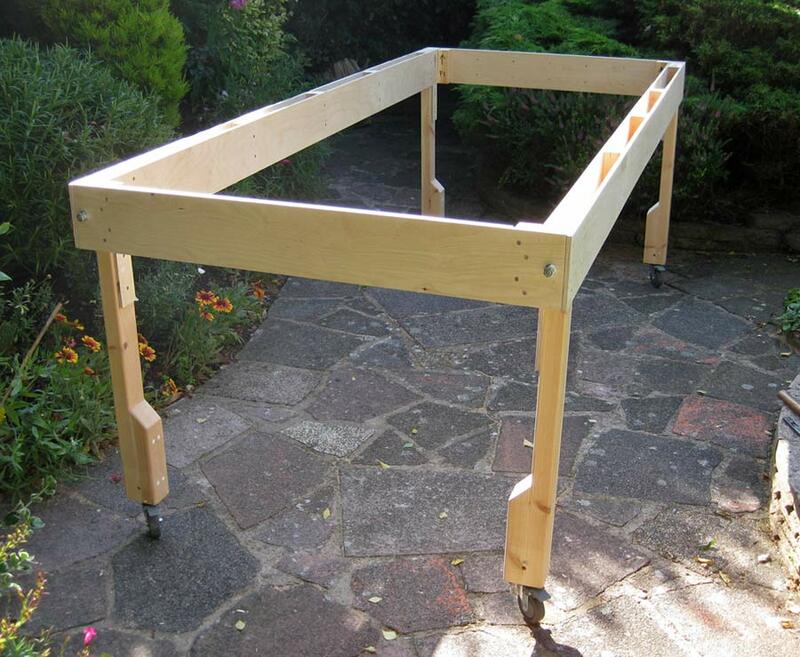 So how to support three separate boards without having the clutter of supporting trestles or lots of legs which would make it impossible to store the bed beneath the railway? I bought three 8’ x 4’ sheets of 9mm birch plywood and the timber merchant cut them to the required sizes for me. I started by making the two side beams. 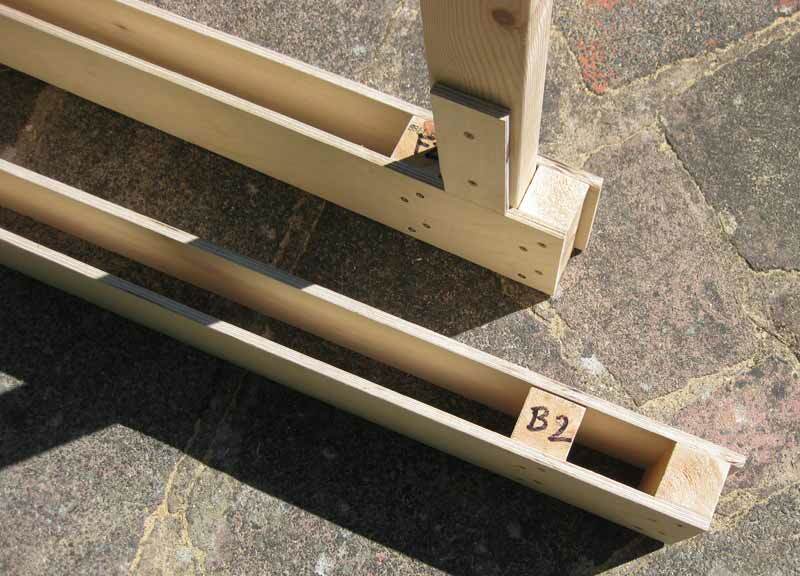 Each beam uses two 8’ x 6” lengths of ply which are spaced apart by blocks of 1¾” square timber glued and screwed into place. At the ends of each beam a couple of these blocks are set to leave a socket for the leg to slot into. Small pieces of ply have been added near the top of the legs. They prevent the beam sliding down the leg during assembly. In this shot the beam and leg are upside down, of course. 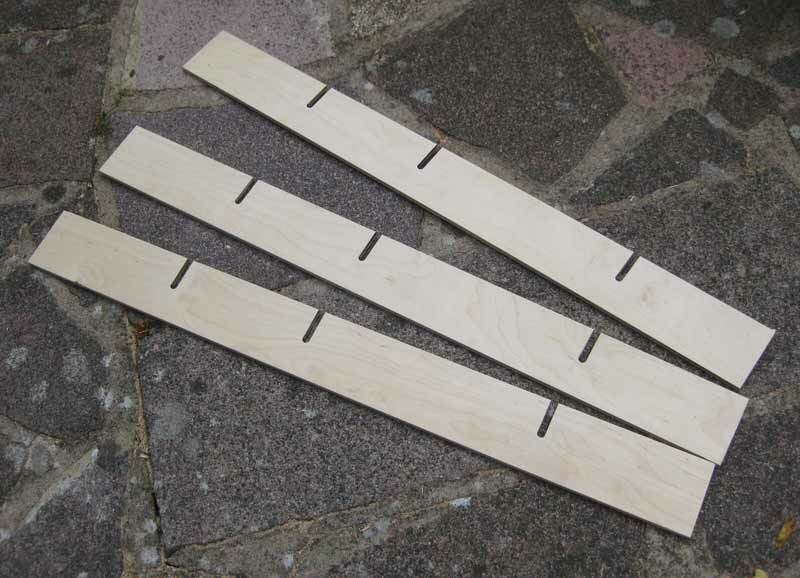 To form the ends two thicknesses of ply were glued together. The next picture shows a beam, the end panel with a locating block fixed to it, and a leg. With the components temporarily held together I drilled a hole through the end panel, the leg and both the spacers in the beam. 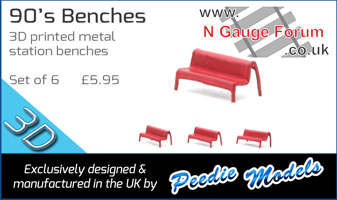 A length of threaded rod passes through the holes to bolt the components together. Here are the parts that make up the base, dismantled. As an experiment I fitted castors to make moving the layout easier. I had to add extra thickness to the legs to provide a large enough area to which to fix the castors. The next job was to make the actual baseboards but before I started I made a full size drawing of the proposed track plan. It would be a roundy-roundy with double track main line, a lay-by siding on one side and a small goods yard on the other. Platforms would be long enough for a six-coach train and a ten-road fiddle yard behind the back scene would store the trains awaiting their turn. A much used formula, I’m sure, and just enough to provide operational interest. I have to admit, though, that building the layout is more interesting to me than operating it. To make the drawing I used the downloadable Peco templates for the points and made up some straight and curved sections on the computer, sticking them all down onto a length of paper. Wallpaper would be fine for this job but I had some photographers’ background paper on hand and used some of that. The photo doesn’t show the full length of the layout; the platforms start at the bottom of the picture. 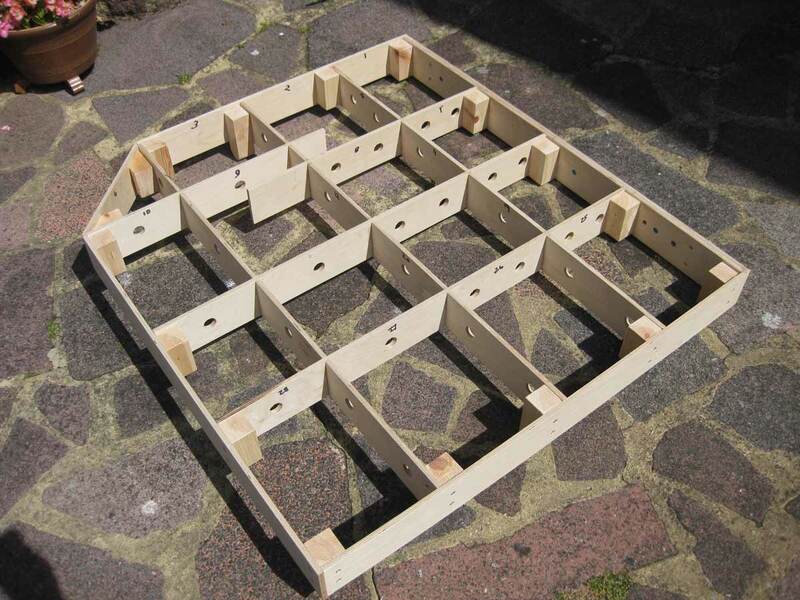 Using this plan I was able to work out where the cross members of the baseboard frame would go, making sure that there was going to be room for point motors to be installed in due course. The lines indicating the chosen locations are faintly visible in the photo. Naturally plans changed a bit when I was laying the track, but more of that in due course! The frames were made using the same 9mm ply I used for the base, this time cut 4” wide. 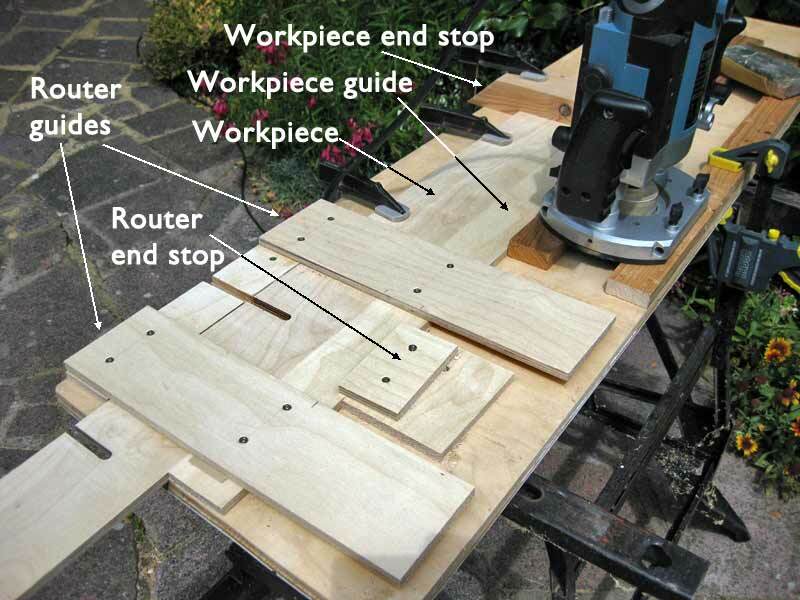 The joints in the cross members were cut with a router. 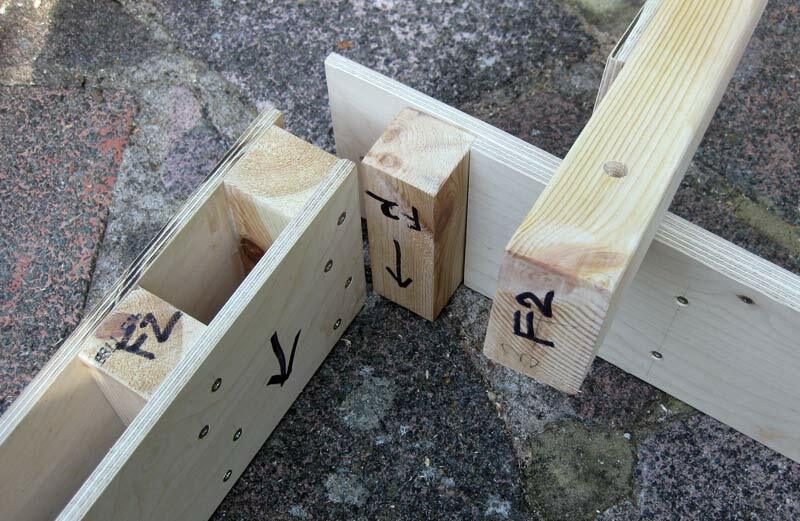 A home made jig ensured that the slots all lined up correctly. After holes had been drilled for wiring to pass through and with fingers crossed the components were assembled. I had originally thought of using an open top construction but later decided to cover the top almost completely with ply. The blocks joining the cross members to the outer pieces are somewhat larger than necessary as I thought I needed them for rigidity with an open top. 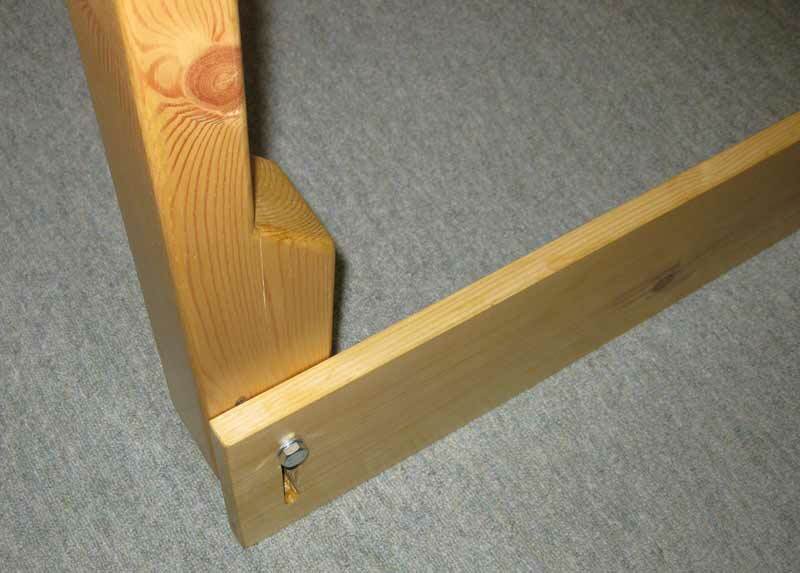 In order to locate the baseboards on the base some of those blocks protrude below the baseboard and locate into the beams of the base. 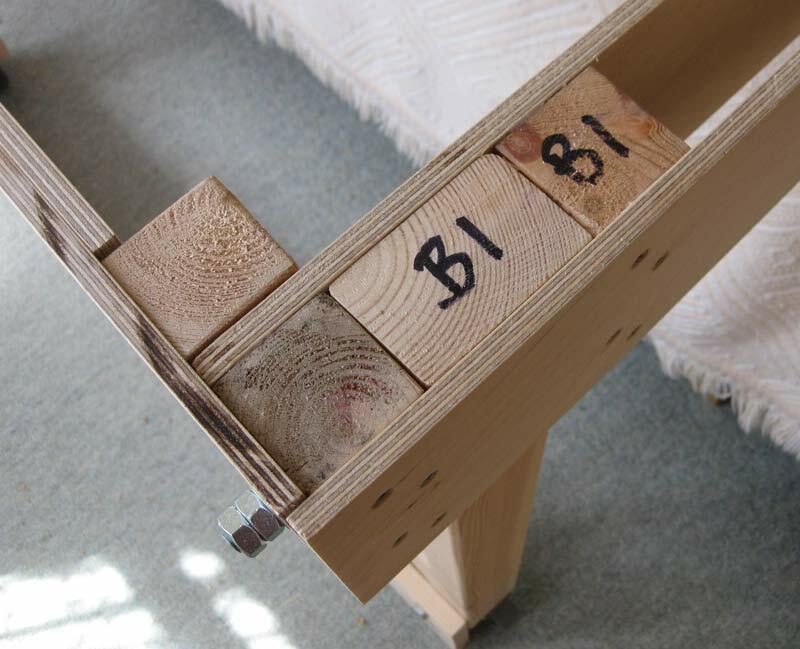 These ‘legs’ were thinned slightly to make a comfortable fit in the beams. DCC Concepts alignment dowels ensure accurate assembly. The boards are held together by M10 bolts. This shot was taken after the tops had been fitted to the baseboards. When all three baseboards had been made everything was assembled indoors for the first time. 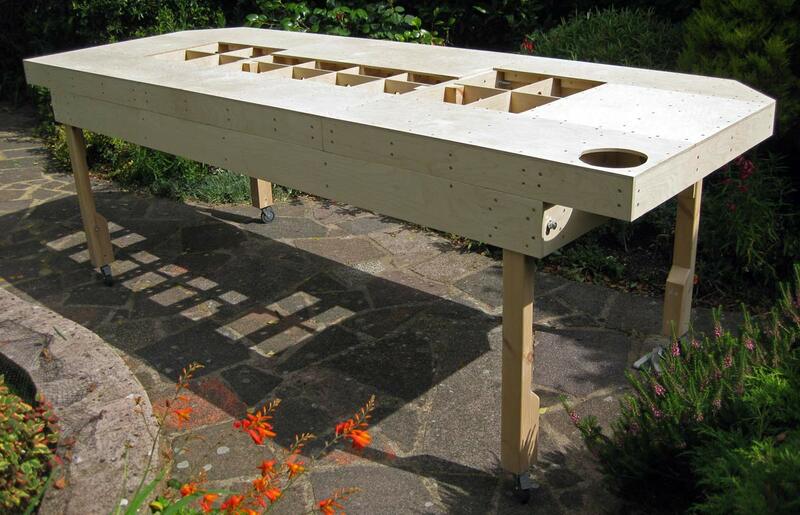 The whole thing was then dismantled and taken back into the garden to have the tops fitted. I didn’t have enough 9mm ply to cover the whole area at this time, the gaps have since been filled with cheaper ply. Here’s the whole thing put together. 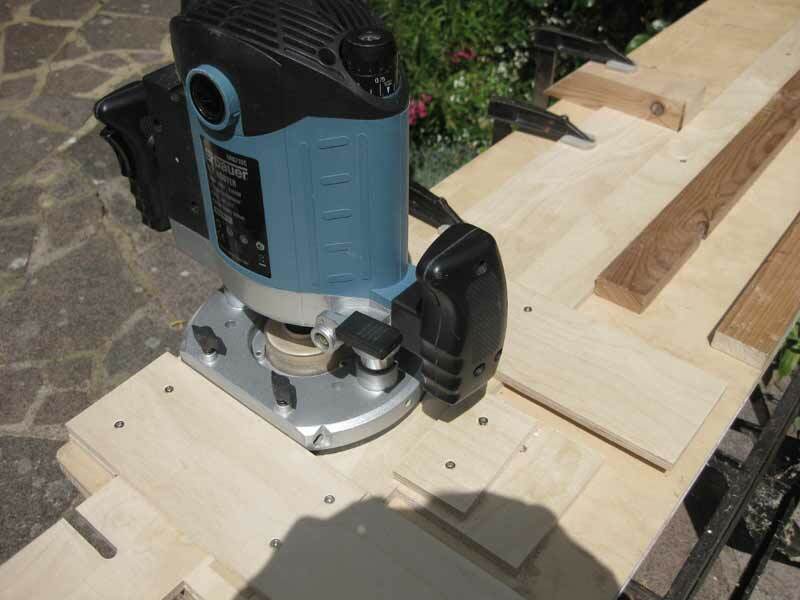 The circular hole in the front corner – it’s actually the back of the layout – is the right size for a Peco turntable. The well from the kit has been popped into the hole and has come in useful as a place to put screws, pins, track joiners and other small parts but so far no actual turntable has been installed! 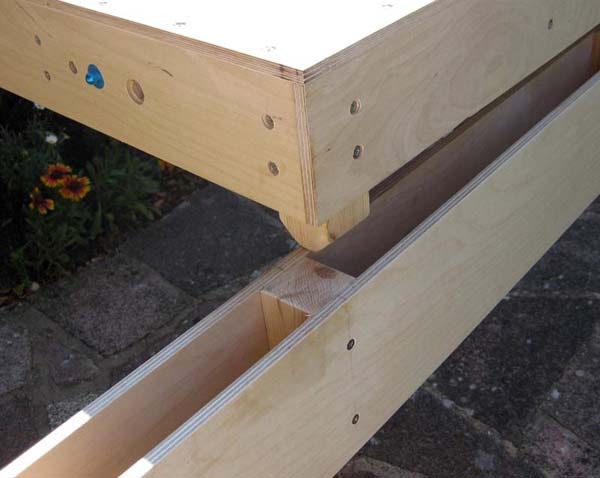 Given the lack of any cross-bracing between the legs of the base you may be wondering how rigid it is. I did find it necessary to add cross-pieces between the legs. Bolts fasten a ¾” thick board through slots. Normally the board sits on the floor but can be raised to allow the castors to rotate freely when moving the baseboard. Even with these cross-pieces the base unit did become a bit wobbly after a while. This was due to the timber of the legs shrinking slightly. I forced some thin card into the sockets into which the legs fit and all has been well since. Yeah, that's quality woodwork right there! You're setting the bar pretty high, Roger . Yet more excellent work. A craftsman in every sense of the word! That's a well- thought out and superbly-executed approach. I like your garden too! Page created in 0.295 seconds with 46 queries.